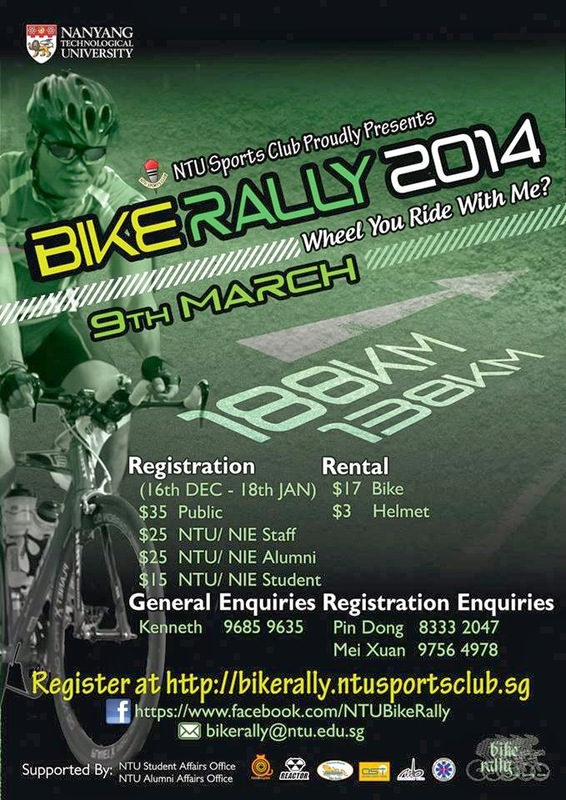 This year is the third time that I am joining the NTU Bike Rally! I first joined in 2011, followed by Bike Rally 2012. I skipped the 2013 version as they were attempting some Guinness world record, which would have made the event very messy. So this year, the offered routes were 138km and 188km, which are longer than the previous distances of 128km and 168km. This means that it would be more challenging than previous years due to the longer route. I was also curious to know how the route would be like, as it is rather difficult to achieve these long distances in Singapore without looping back and fro. As usual, the route details are not released prior to the event. The location of the next checkpoint will only be revealed once you reach the current checkpoint. This supposedly keeps the ride more interesting as you will not know where you are going next. However, this also makes it a bit more difficult to prepare for the ride. Anyway, the route for each year is quite similar, so there would not be major changes, or would there? 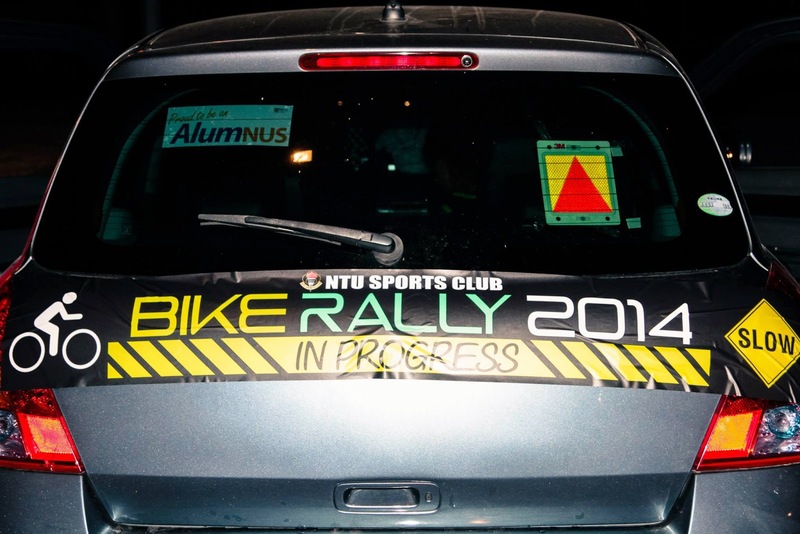 This year, the NTU Bike Rally 2014 is starting from the F1 Pit Building, on 9th March, Sunday. Registration starts at 5am, but there is no need to go so early. Reaching at 530am or 6am is early enough to register and get ready for the ride, which starts at 7am. If you are driving down with your bike, the Singapore Flyer has the nearest carpark, but parking is expensive! The parking charges from 530am to 430pm came up to $33 dollars for 11 hours, as it costs $1.50 per half hour of parking. I have always found it easier and faster to ride in a small group, as it is easier to go through traffic junctions without the group getting cut off. Also, it is easy to make changes to the route without asking too many people. For this time, we were in a group of 3. Myself, my wife and Badrul. 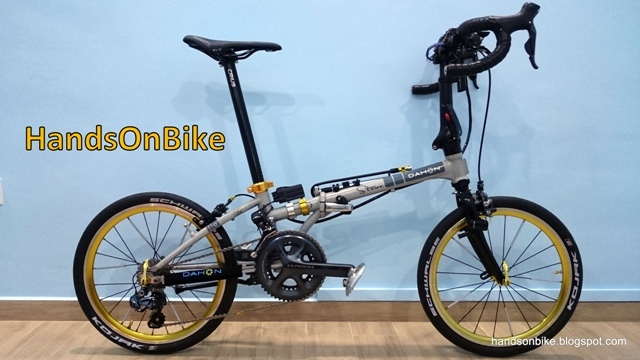 We were all on Dahon folding bikes. I was of course on my trusty Dahon Boardwalk, my wife was on the speedy Dahon Vitesse, and Badrul on his ever reliable Dahon Speed. 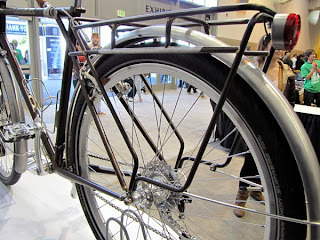 These were all modified 20 speed Dahon bikes! Since we did not plan to go for the longer route, we decided to wait by the side and let the speedsters go first. This time, we were in the 3rd wave of cyclists, which set off about 15 mins later than the first two groups. As usual, the route brought us up Bayfront Avenue, down Shenton way and towards Keppel Road. Normally, we would then travel along this road all the way to the first checkpoint, which is West Coast Park. However, this year's route is rather different! The route actually sent us on a right turn towards Cantonment Road, and then along Jalan Bukit Merah. This is interesting as I don't think I have traveled this area before. Also, the terrain along this road is rather undulating, and there are many traffic lights along the way, which means it takes a bit more effort to keep the momentum going. After that, we traveled down Alexandra Road, past Queensway to Pasir Panjang Road, before heading into West Coast Park for the first waterpoint. This route is actually better and safer as it avoids the Vivocity area, where it can be messy and dangerous, with multiple lanes going to different places. If this was the intention of the organisers, well done! From West Coast Park, we went along West Coast Highway, past the Jalan Buroh roundabout, and along Jalan Buroh. The next turn off point is actually at the Jurong Island bridge roundabout. This is the point where the route splits. The 138km route will turn northwards along Jalan Boon Lay as shown, while the 188km route would bring them towards Raffles Marina at the far west end of Singapore. Again, this route is different as the normal turn off point is at Pioneer Road North. After that, it is a pretty long stretch all the way to the main entrance of NTU as can be seen from the map below. Slightly longer than the usual route along Pioneer Road North. Second part of the route, from West Coast Park to NTU. 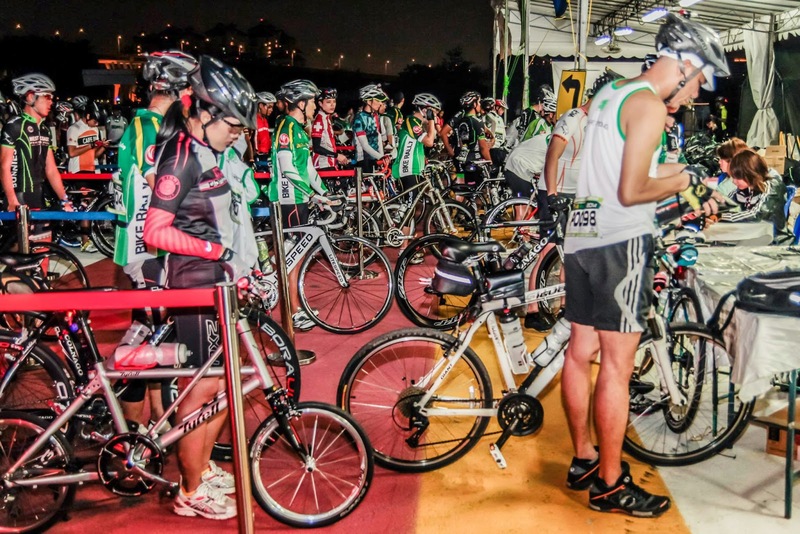 The previous water point in NTU is at the Sports and Recreation Center (SRC), which means a relatively flat ride to the water point. This year, slopes galore! The route actually goes along the perimeter of NTU / NIE, which means going up the long and steep slope outside Hall 7! Luckily we were rather familiar with the NTU terrain, having cycled here for a few times already. Thus we were mentally prepared for the slopes. Together with our 20 speed bikes, we were able to handle the slopes without stopping. Many riders had to stop and push as they either did not have the necessary low gearing, or were just not strong enough to pedal up the slope. This must be one of those places where those on a bike with a single front chainring would wish that they had a front double chainring for lower gears! Water point is at the back of the compound, at one of the NIE carparks. Since we were there pretty early, there was plenty of water, bananas and buns. There was even Red Bull available. I actually left the checkpoint with more food than when I entered. The only complaint here is that the toilet is up this long flight of stairs, all the way at the top and far in. Probably not ideal considering that we just cycled up the NTU slopes. We stopped for about 15mins at this checkpoint. The next checkpoint would be at the carpark after Kranji Dam! Riding along Jalan Bahar and Lim Chu Kang road was rather tough, as there were strong headwinds all the way. I could also see many people struggling with the winds and some even had leg cramps so early in the ride. Nevertheless, this road is not new to us and we were able to conquer it (although it was slow). Yet another surprise near the Neo Tiew road junction! Normally the route would turn right onto Neo Tiew road, before exiting at Kranji Dam. This time, we actually went further down before turning right. This road is actually much better to cycle on as the road surface is smoother, and avoids the speed limiting strips along Neo Tiew road. Once again, nice route planning from the organisers! By this time, the weather was starting to get really hot and sunny, even though it was only 10am. Nothing special at this checkpoint. Basically it was top up water, eat some snacks and move on. We stopped for about 10mins here. The next part of the route is the killer part. The planned route for 138km is actually to ride down Woodlands Road, and turn left to Mandai Road. At the other end of Mandai Road, turn left to Sembawang Road and then Gambas Avenue, before going up to Woodlands Waterfront for the next checkpoint. This would have been really tough, especially with the slopes along Mandai and Gambas. In order to preserve our energy to ensure that we can reach the finish line, I made the decision to cut straight from Kranji to Woodlands Waterfront, as seen from my route shown on the map below. This shortcut actually saves almost 13km, and avoids the slopes. My plan was to actually ride the shortest route from checkpoint to checkpoint, avoiding big detours if possible. On hindsight, I am glad we took the shorter route as I was really struggling at the end of the ride. As a bonus, this route is much more scenic, as we went past the Woodlands checkpoint, and then along the coastline! The view of the coast was quite amazing, and we could see every building along the Johor Baru coastline. This would be a nice place to cycle and relax. The 188km route is much tougher than this! From Kranji Dam, the route would bring the cyclists all the way down to Bukit Timah, along Dunearn Road, and then come up along Upper Thomson Road (I think), then to Woodlands Waterfront. That would have been a huge detour, and add a huge chunk of mileage! I can't imagine myself tackling that extra distance. Our route from Kranji Dam to Woodlands Waterfront. Standard 138km route (not shown) actually goes along Mandai Road and Gambas Avenue before going to Woodlands Waterfront. Of course, we took our time going from Kranji Dam to Woodlands Waterfront, using mostly the PCN and pavement and generally going slowly, as we were well ahead of time. It was only 9km from Kranji Dam to Woodlands Waterfront, compared to the 22km it would have been if we followed the planned route all the way. The weather was really hot by now, so we took a longer break and of course drank lots of water and snacks. Rested for about 15-20 mins here. Next stop, Punggol Jetty! From Woodlands Waterfront, we cycled along the northern part of Singapore, to the north-eastern part of Singapore. This was the toughest stretch of the route, as it was really hot and sunny by now, and there was very little shade along this route. I actually felt a little bit of cramps in my hamstring, and took a break to put on some Deep Heat cream. Better to put some as a preventive measure, than to wait till it actually cramps up. The worst part was along the Punggol Barat / Timor Islands, where it is hot and dusty. The riders were also spread very far apart, with everyone going at their own pace. It must be rather interesting to see three folding bikes going along in a small group at a good pace. When we finally reached Punggol Jetty, we were so glad to take a break from cycling. The sun was blazing hot by now, and there was practically no shade at all at the checkpoint, apart from a few sparse trees. This was also the longest stretch without a waterpoint. Once again, load up on Aquarius isotonic drink, water, buns and raisins. Think we stopped for about 15mins here. The planned route was to take the road out of Punggol Jetty, all the way down to Buangkok East Drive, before traveling along Tampines Road to Pasir Ris Drive 3. This is again a long detour, which I could not afford given my lack of fitness/training/energy. To make it worse, the road out of Punggol Jetty is actually a long upslope, which I knew from previous rides. This is why it is useful to know the route beforehand, especially from experience, as you can then prepare yourself appropriately to tackle the terrain. So once again, we took a shortcut by cycling along the Punggol PCN all the way to Lor Halus bridge. The PCN along this stretch is actually very quiet and scenic with hardly anybody in sight, especially under the hot sun at 12+pm. Also, the previous red clay path has also just been paved over and so there is no problem traveling along this route. We took our time along this route as there was plenty of time. I was quite familiar with this route as I had just cycled there the previous week, so there was no risk of getting lost. After turning onto Pasir Ris Drive 3, we then turned onto Elias Road, which is rather slopey. The next waterpoint is near the carpark at the end, where the roundabout is. Taking this route instead of the original route saved us about 6.5km. Not so much considering the entire bike rally distance, but every bit counts when you are low on fuel. Nothing special at this checkpoint. Stopped for about 10mins to fuel up and move on! We took the same route out and emerged onto Pasir Ris Drive 3. Going straight down along Pasir Ris Drive 3, we then went onto the PCN and cut across to the side roads at the back. This avoids the slopes along Loyang Avenue, and also meant that we could cycle slowly at our own pace, without jostling for space with the vehicles on the main road. From there, we then turned out from Loyang Way to rejoin the main route along Loyang Avenue. We then stopped at Changi Village to take our lunch break! This is not an official stop, as there is no Bike Rally waterpoint here. However, we have been stopping at Changi Village for lunch every year for the Bike Rally, and this year is no exception. The good food there is also a strong motivation to stop and take a break. Since this NTU Bike Rally is not a race, we took our time to order lunch and some cold drinks. Roti Prata + 100 Plus is a pretty good lunch, and it was a good chance for us to rest and refuel. After around 40mins, we set off from Changi Village to continue on our journey. This time, it would be along Changi Coast road, all the way to East Coast Park. It was also along this stretch that we broke the 100km mark. Luckily for us, it was not too windy along Changi Coast road. But it was a rather long road that can be rather taxing on the body and mind. Also, our legs had gone cold after resting for lunch, and it took quite a while to get the legs warmed up again. There was no waterpoint at NSRCC, so we didn't stop there and continued to East Coast Park Carpark F2, where the waterpoint is. We were glad to take a break from the long and boring stretch of Changi Coast road. To our delight, there was an ice cream van located strategically just beside the waterpoint! The ice cream man certainly enjoyed good business on that day as I spotted many cyclists buying ice cream from him. We stopped for about 15mins here. Now, for the last stretch of the Bike Rally! The route is very simple, just travel all the way to the Fort Road end of East Coast Park, exit to Fort Road and then go along Nicoll Highway back to the F1 Pit Building. Cycling in East Coast Park on a weekend can be very dangerous, with kids and pets running all over the place. There were a few near misses, and those were only avoided because we had anticipated them. By this time, we were rather tired and not going fast, at probably just over 20km/h. I even had a stitch on my side while cycling, which I didn't thought was possible. After resting for 10 mins I managed to shake it off and continue on our way. Exiting onto Fort Road, we linked up with some other road bikes which were also going on the final stretch. It was obvious that everyone was tired by now. In any case, we more or less stayed together in a group all the way to the finish line at the F1 Pit Building. This last stretch was surprisingly fast as everyone wanted to finish the ride strongly. We were rather disappointed to see that there was no photographer at the finish line. To think that we deliberately slowed down when approaching the finish line to avoid other people and photobombing! The weather was still very hot, which could be why there wasn't anybody stationed over there. The official timing by the side of the finish line showed 3.59pm when we crossed the line, coming in just a minute under 4pm. Overall route that we took for NTU Bike Rally 2014. Distance is about 126km. In the end, the distance covered was comparable to previous years, and at at similar timing. This distance is rather accurate as the plotted distance on Mapometer is similar to that from my speedometer. From start (7am) to finish (4pm), the entire duration was 9 hours. However, from my speedometer, the moving time was actually only 6 hours and 20mins. This meant that we actually stopped for more than 2 and a half hours. The rest stops certainly didn't seem that long as we only stopped for 10-15 mins at most of the waterpoints, but I guess it all adds up. Even with the shortcuts, we still clocked a respectable distance of almost 128km, which is the planned distance for previous years of NTU Bike Rally. This year's edition is tougher than usual, as the route had more sloped terrain and was also longer. Also, another factor was the heat. It was very dry and sunny, making it very tough to cycle for the whole day. 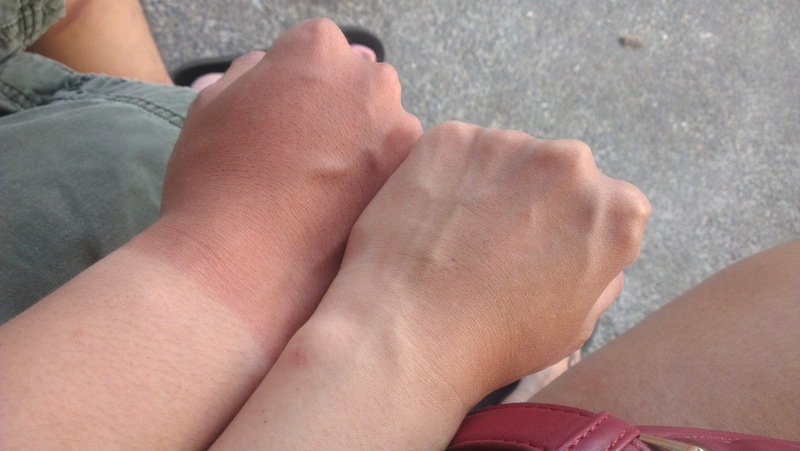 My two-tone arm after the ride! I wore armsleeves but not gloves. By my own calculations, if we had completed the full "138km" route as intended, it would be 126.5+13+6.5 = 146km! That is definitely more than the supposedly 138km route. I can't even imagine how far the 188km cyclists would have to travel. I am rather happy with this accomplishment, considering that the previous longest ride was 70+km the week before, and no round island rides at all for at least 1 year prior to this event. There were also no mechanical problems at all for this ride, unlike in 2012 where we had a puncture. Overall, this year's event is well managed as there are adequate signs at the turn off areas to prevent people getting lost. There were also many marshals situated at all the major junctions to direct the cyclists onto the correct route. The route was also well planned, avoiding messy and dangerous junctions, and also minimizing the number of right turns required. No shortage of supplies at the rest points, which is probably also because we arrived at the rest points comparatively early. Well done to the NTU Bike Rally 2014 Organising Committee! The student organisers must be very happy to receive such a pleasant post and commentary by you! There is still time to condition yourself, you might want to target the shorter route this time. Start increasing your distance every week , until you hit at least 80km for a single ride. Stop for a short break only once every 10 to 15km. Try to maintain cruising speed of 20km/h. If you can achieve all these 2 weeks before the bike rally, you will be good to go!